"Nimona began as a weekly comic online. Slowly, what began as a humorous look into the lives of a villain and his shapeshifter henchwoman transformed into a full length graphic novel packed with action, tragedy, and occasional jokes about sharks. The book takes place in a medieval-sci-fi setting where a supervillain named Lord Blackheart battles the seemingly heroic Institution and its champion, Sir Ambrosius Goldenloin (no typo, no lie). 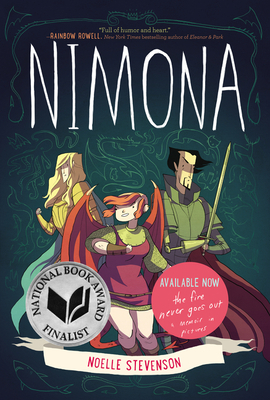 When a shapeshifter named Nimona shows up in Blackheart’s lair asking to be his sidekick, her abilities will put the conflict on a more destructive course… I normally read graphic novels very quickly, and Nimona is no exception. However, the book fits a lot into it’s short length. The jokes are riotous, and even when the plot takes a more serious turn, the writing’s quality never suffers. Even from the very beginning of the book, it is clear that Blackheart is not a very villainous villain, and the reversal of good guy and bad guy makes for interesting reading."